In the world of college basketball, the University of Georgia Bulldogs are 15-0 (2-0 SEC) and ranked eighth in the country. No, not the men, but the women. The Lady Dogs are off to their best start ever after outlasting Kentucky (12-2, 0-1 SEC) 61-60 in overtime the other night. Florida (9-6, 2-0 SEC) will be visiting tonight and the game will be broadcast live on ESPNU at 6:00 PM tonight. This semi-live blog will tip off around 5:45 PM ET or so, but may start earlier. Feel free to jump in and join the conversation! If you are tweeting and want your feed added, let us know. UPDATE: Do to circumstances beyond our control, we are going to have to cancel this semi-live blog. Tune into ESPNU for the game. Sam Gore will have the play-by-play, and Stephanie Ready (pictured left) will be the analyst. 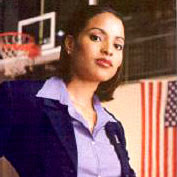 Ready played for Coppin State (93-97), and in 2001 became the first female coach in a men's professional league.